Hi! My name is Vicki and I am a mom to three humans and 4 fur kids. 2 mini schnauzers aged 15 and 2 cocker spaniel aged 10. Long story short I sent my beloved schnauzer Trinny to peace, recently. Well maybe not but it feels like yesterday. I'm heartbroken and devastated. After a bit I felt ready to open my heart again. My other doggos are all about the same age and I'm terrified that they will all leave around the same time. The thought of another schnauzer was not an option as I can't look at another without sobbing. ( except her sister who is still with me). I wanted to rescue, but my husband refuses to have any pitbull or pit mix in the house, our youngest is 14 and he doesn't want to chance anything. Which is why we had purebred so we knew the pedigree, parents etc. With her being 14 we can branch out a bit. Most rescues I looked at had lots of pits and pit mix which were a no, since I'm respecting my husband wishes as he respects mine to add to our pack. So I look at tons of rescues and find a few pups that clearly have zero pitbull in them. I apply and get approved for a pup. We picked him up, brought him home. He was surrendered/taken by the county from a lady that had to many dogs for her ordinance. He is white and fuzzy, I didnt/don't care about his pedigree, but now I'm curious. He is looking rather husky to me. He is smart as a whip. He's been a breeze so far. He s crate trained already, knows sit down and shake. He goes in his crate when I tell him. He plays and plays and plays. He is tireless. He gets bored with toys, so we have a zillion to keep him entertained. He loves to dig. He walks great on a leash. He loves my other dogs and plays endlessly. He loves all people. Does he look like a husky? Could he be one? There could be some in there but probably a little ways down the line. How big and what age is he? If you want to know for sure I would get a Wisdom or Embark test done. Wisdom is pretty cheap and both are easy. Just swab their cheek, send in, wait a few weeks and they email you the results of your dna test. He's about 15 pounds at 8 weeks. I love him to pieces. Are those tests accurate? I hate to say it but I have to agree with @TwisterII (( I'm going to get myself in trouble with some bad ... )) Siberians are an Asian dog and as such have the almond shaped eye of most asians. Your pup has the typical "round eye" of European / American dogs. The ears threw me a bit, but some (most?) 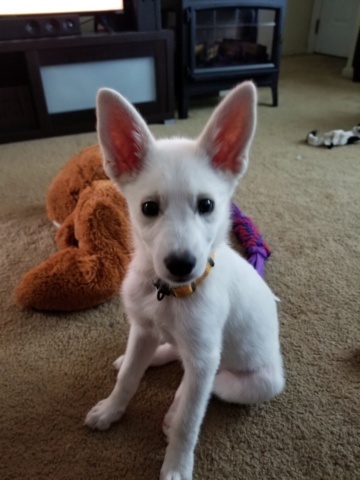 Huskies have very oversized ears for a bit as they grow up and into the ears (and typically their paws) ... and on that note, for an 8 week old pup, his paws are much too petite for a larger dog. The results that have been posted here have been surprisingly good. With a mixed breed who "looks like a Husky" they tend to show the Husky as the larger percentage with some oddly surprising breeds in the mix. The DNA tests are fairly accurate and getting more so all the time. As the database gets larger should a change be made to the determination of your dog's breed mix they will also update you. They are very good at spotting the breeds. Usually the only thing that might change is the percentage makeup. They also offer health testing with their DNA swab. Both have MDR1 gene mutation testing included. MDR1 is always useful to know as certain medications can cause adverse reactions in dogs with the mutation. Embark offers testing on nearly 200 different genetic markers but you definitely pay for it with them. Wisdom at the cheaper price includes MDR1 and a collapse disorder more prevalent in collie mix dogs. I have done both tests. Embark is more useful for people looking to breed their dogs and deep research into genetics (you get a lot of scientific information). Wisdom is great for general knowledge and you get your results much faster usually. If I were to guess on looks alone, mostly on ears, snout and eyes, I would bet German Shepherd/Husky mix. Maybe some Malamute? 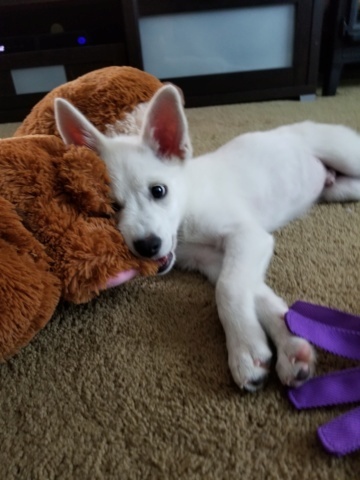 he is cute, i would say a German shepherd/husky mix. Shepard/something. Shepards can be all white. That's going to be one beautiful boy. 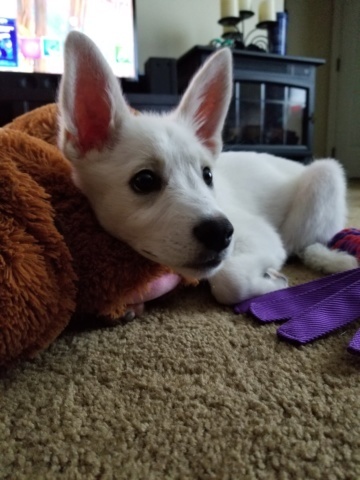 Looks Alaskan Husky, but those ears! Definitely has German Shepherd in him, you'll have to wait until he gets a little older to see what breed is his personality and there could always be more than 2 breeds in him. Still, beautiful dog. First, my deepest condolences on your loss. I understand completely. My beloved malamute Teaka (means heart companion) passed three years ago and I will never stop missing her. I'm actually very grateful she had very unique look, because I'd loose it if I saw a dog that looked a lot like her.